One of the fun aspects of sharing with you here in the CLASSroom is finding new designers and showcasing their ideas here with all of you. This month we our Mix-It-Up Challenge showcases Pinkfresh and our Essentials by Ellen line. We wanted to encourage you to try the Pinkfresh products because they pair beautifully with our private label line! Today we are thrilled to introduce Nancy Damiano, one of Pinkfresh's designers! Nancy has been paper crafting for 10+ years and is as in love with it today as much as the fateful day she stumbled upon the scrapbook and card aisle at Michael's. While she is a seasoned scrapbooker, card making has been taking up more and more of her crafty time. She is learning all the techniques that go into these small works of art and has a passion for the color aqua, Disney World, and anything paper + craft. You are likely to see her talent shared all over the internet, but I encourage you to visit her blog Nancy Damiano - Creating at the Paper Orchard! We would appreciate if you would share some comment love with Nancy for joining us here today! Look for the post that shows a sneak peek of the project below along with a special giveaway we have for you there. Please leave Nancy a comment before October 19th for a chance to win a $50 coupon to use in our store! Combining my scrapbooking and stamping obsessions is a challenge and one of my favorite ways to create! Today I’m combining the beautiful colors and patterns in the Pinkfresh Studio Indigo Hills collection and the perfection that is Julie Ebersole’s Stay Golden stamp set. This design features one of my favorite shadowbox techniques. To create the shadow box, begin by cutting out a large title with an electronic die cutting machine. You could also draw the large letters by hand and cut out with an X-Acto knife. Next, place a sheet of white cardstock underneath the cut out and lightly trace the title. This will service as a place guide so that all of the cutouts can be filled without gaps peeking through. Using the pencil marks, fill in the letters with a repeating stamp like the small pineapples above, a favorite photo, some patterned paper and a stamped sentiment. Use foam adhesive on the back of the cut out patterned paper to give your shadow box a little lift. Carefully adhere to the background sheet making sure all of the “windows” are filled. To create a custom embellishment, use the pineapple stamp and a MISTI tool. Stamp the first time with a light yellow pigment ink. Then re-ink jus the top half of the pineapple image with a deeper shade of yellow ink and stamp again. This creates a pretty shadow effect. Complete stamping the stem and grid over the pineapple shape. Then either use the coordinating die or fussy cut the shape. Use a yellow misting ink to add droplets of yellow paint to the layout background. Add a swish of yellow paint to the right side of the background to break up some of the gray pattern. Combining scrapbooking and stamping is a paper lover’s dream! All of the colors used were based on the Indigo Hills collection. Sometimes picking the right colors is the hardest part. Using a palette that has already been worked out saves on time and coordinates the look. Whether you’re a scrapbooker, cardmaker or DIYer, the shadowbox technique can be altered to your favorite techniques! My youngest typical teenager -- walking on the beach, with cell phone glued in her hand, LOL! But Pokemon Go had just come out and to be fair -- my kids persuaded me to download it, too, and play (and walk!) along, exploring the beach! I started with an 8-inch Neenah Solar White base. Next, I used two pieces of the same Pinkfresh Studio-Life Noted 6x6 paper and pieced them together, side by side, to span the width of the 8-inch page. I liked the nice white border left to work with at the top and bottom of the page and this is a great way to use the 6x6 papers on a larger format page! At the top, I stamped and die cut the largest pineapple from Stay Golden and popped it up on foam tape. The great sentiment (don't you LOVE that font?!!) is also from Stay Golden. The pineapple was created using Zig Clean Color Real Brush markers. I started with the large solid pineapple and colored directly on the stamp, using #52 Bright Yellow and shaded the lower right with a little #61 Light Brown. A little more color can be added to the stamped and dried image, if needed. I added a little #51 Lemon Yellow. For the leafy top of the pineapple, I used Zig #41 Light Green and shaded with #40 Green. Below, you ca see I didn't spritz the stamp with quite enough water and was left with some splotchy leaves. A waterbrush came to the rescue! Using plain water, just move and blend some of the stamped color around a little! The surf board was die cut from another paper pattern in the Pinkfresh Studio-Life Noted 6x6 paper pad -- there are some really fun patterns in this line of papers, with some great coordinating embellishmets! The Taylored Expressions On The Line-Beach die cuts only the inside halves of the palms. For the left tree I cut an additional matching palm half and made it a full tree (great versatility)! And note the cute coconut accents (also from the On The Line-Beach die set)! The page was finished with a sprinkling of Doodlebug Sprinkles Beetle Black Glitter enamel dots and a little journaling using Copic Black 0.3 Multiliner. Thank you for joining me today! I hope you found a few techniques or tips to try and certainly hope you are holding on the last bit of summer, just like I am . . . Ironically, it's been raining for the past four SIX days here! I hope you enjoyed today's project, and please let me know if you have any questions. Hi there! Carolyn Peeler with you today to share a winter themed tutorial with you here in the CLASSroom. Check it out, today you will find this sweet card along with a Clean and Simple bonus layout, both of which feature the same winter quote as their focal point. And as a treat for you, we have made the quote available to you as a pdf file which you can print and/or download (scroll down to near the end of the post to find the link). Please note, while the card pictured below has a missing comma after the word "warmth", it has been corrected on the pdf. Here is today's video. As always, please let me know if you have any questions in the comments field and I'll get back to you as soon as possible. Now that you've watched the video, now you're ready for the download, right? Here it is, this is an 8.5" x 11" sized pdf and I recommend printing it onto cardstock for best results. Finally, here is a link to the products used in today's projects. (The white buttons are vintage buttons from my stash. I often pick up jars of white buttons at antique malls.) Happy Shopping! I'll be using it to organize my postage stamps! This new little album will replace this . . .
. . . Postage Keeper I made SIX years ago (click on the photo to be taken to the tutorial here in the CLASSroom, if it may suit your needs a little better). The old one was finally getting a little worn and my needs had outgrown it, so I set out to make an updated version! You could also use this new version as a mini album that's smaller, less bulky, and a little easier to mail or carry around in a purse/handbag, when you want to whip out current photos of your children, grandchildren, pets, etc! 6. Once the Multi Medium dried, I placed some Tim Holtz 1/2" Brads through the holes I previously punched in the spine (re-punch the holes after covering them with paper) and attached four We R 4" photo sleeves inside the album. By attaching the photo sleeves with brads, you are able to add more sleeves as needed! 7. To finish the front cover of the album, I cut a strip of the back of the pineapple paper and created the POSTAGE word with alpha stickers from the BasicGrey South Pacific Collection Pack paper. TIP: To get perfect sticker letter alignment, place the letters lightly along the top edge of a ruler, then line up the word where you want it. Lightly press down the tops of the letters, keeping your fingers in place to hold the stickers. Then you should be able to gently pull the ruler away from the bottoms of the stickers, leaving them in place on the paper! 8. To finish the album, bone crochet trim was added to the top of the green strip on the album cover, as well as a piece being added to the back cover of the album and wrapped around to the front to form a latch closure. The finished album measures approximately 4.50" x 5". I can't wait to see what you may create with this little mini album idea! We are so very excited to welcome Kelly Purkey to the CLASSroom today! Last September I was fortunate to be able to attend a special educational weekend at the Hero Arts headquarters and meet Kelly as they debuted her new line of products. Kelly's passion for travel and food are apparent in everything she has created! We would like to invite you to grab your favorite beverage, get comfy and head over to Kelly's blog to take a stay-cation with her! Learn how to document your travels, food passions and more by following along on her Instagram journeys! You can also find her on Pinterest, YouTube and Twitter. We would appreciate your help thanking Kelly for sharing her creative process as she documents her travels in today's video. Please head over to her Instagram account, Kelly Purkey, and leave a comment there by July 18th. Look for the following photo where she shares a peek of the project below. One lucky random winner will receive some of the goodies she used to create her fabulous travelogue pages. Hi everyone, it's Kelly Purkey here to share a little look at my Clearly Kelly products in action. I've collaborated with Hero Arts on this fun line of products and I hope you've been enjoying using them! They're the perfect size for cards, Project Life, planners, and notebooks. In my project today, I used them to create a spread in my Midori Traveler's Notebook. If you haven't seen all the fun things that are being made with the Traveler's Notebooks, you can check out the hashtag #travelersnotebook on Instagram. There are so many amazing ideas there! The Clearly Kelly items are perfect for decorating your own notebook. Here I created a spread to document a recent getaway to Las Vegas using some of the new Clearly Kelly sets. I filmed a process video so you can see how it all came together and how I incorporated the products. You can enjoy today's video below or in HD on the Ellen Hutson YouTube channel HERE. If you are new to us here we would love for you to subscribe! I hope this gives you some ideas for using the stamps on your next project! For more inspiration, please hop over to my blog or view more process videos on my YouTube channel - I'd love for you to subscribe. Thanks everyone! Last winter we were blessed with a special celebration in our family. My oldest son was married two days after Valentine's Day. It was a gorgeous winter wedding and to see them both so happy was an incredible joy. One of my favourite photos of this special day has been sitting in my craft room for ages and I was excited to finally get it onto a scrapbooking page. I'd like to share a little of the process with you here today. One of the elements I really love to design around is texture. While we usually start with some cardstock as a base for a scrapbook page, I decided to experiment with some beautiful corrugated cardboard to make a strong and beautifully textured base. A great way to highlight texture is to brush paint across it. The paint adheres to the highest points of the textured surface and allows the lower sections to remain untouched. To create pattern as well as texture, I used a template over the corruaged paper and then applied my paint. As you can see I left some of the template unpainted so that the pattern and paint just seem to fade off in the design. I used the Harlequin 12x12 template by Crafter's Workshop. You can find other great templates to get a similar look here. The most important part of almost every layout is the photo. Placing the photo and larger elements into the design first is the best place to start. From there on, I just keep adding little details until it "feels" right. The chipboard elements in this project have been coated with the Silver Leafing Krylon Pen and the sweet wood buttons with Shell Pink Acrylic Paint. These shimmery dark silver letters were a great way to add a title to the design. Finally, here's a close-up of my wonderful son and daughter-in-law. Thanks so much for stopping by the CLASSroom! Have a fabulous weekend! These Copic leaves are easy to create, and will look fabulous on anything this month ... birthday cards, sympathy cards, thank you notes, Thanksgiving cards, dinner menus and/or place cards, and scrapbook pages! Spritz inks with an alcohol-filled Mini Mister to move the color around a little. Lay Glossy Cardstock (glossy side down) into the ink and lift the cardstock up (don't just smoosh/swirl the cardstock all over the inks, or you will end up with mud!). Next, die cut your custom background paper with Tim Holtz Bigz Tattered Leaves Die in Sizzix Big Shot machine. For calendar front, cut a 5.50-inch piece of Ellen's Woodgrain Embossed Cardstock, then die cut with Impression Obsession Square Shaker Frame die to create a frame for the calendar. Accent the woodgrain embossing of the white cardstock with Antique Linen Distress Ink with an Ink Blending Tool. Pop woodgrain up with 1/2-inch Copic Foam Tape over a 6-inch brown cardstock base. Print Ellen's 2013 Ring Binder Calendar at 85% (to yield a 3.25-inch calendar) onto Neenah Natural White Cardstock. Trim calendar closely and adhere to brown cardstock base below the woodgrain popped up piece. Die cut brown cardstock with My Favorite Things' Jumbo Ric Rac Die and adhere to right side of calendar front. This will serve as an anchor/guide for arranging the leaves. Adhere leaves to ric rac with foam tape and/or Glue Dots. Finish calendar by adhering Essentials by Ellen Satin Gold Sequins with Glossy Accents onto calendar front. You could also use this same idea and layout for a greeting card (either birthday or Thanksgiving -- just circle the important date on the calendar! ), or scrapbook page (just replace calendar with a photo). I hope you have fun with these leaves! Happy weekend, everyone! I was in the mood to get scrappy today and decided I needed an updated Spring scrappy magnet page to spruce up my fridge, so here ya go! I adore the huge variety of dies Ellen carries -- they make any kind of papercrafting project so easy and professional looking! Today I used a great sized (approximately 1/2") classic font die from Memory Box that worked well on my 6x6 sized page and are also a great size for creating your own sentiments for cards, Typewriter Lower Alphabet & Typewriter Number Set. I started my project with all these pretty coordinating patterned papers from My Mind's Eye Memorable 6x6 pad, from which my title and year were also die cut. For small/thin/narrow die cuts like these, I like to use Zig's 2-Way Glue Squeeze & Roll pen to adhere them and EK Success' precision Tweezer Bees are wonderful to use when trying to get die cut placement just right! I adhered the year die cuts to My Favorite Things cute Say What? Die-namics speech bubble die. The pretty flower was made with My Favorite Things, Winter Rose die and the wavy border is MFT's Jumbo Ric Rac cut in half. Have you noticed the sequin trend in papercrafting lately? Well, Ellen has you covered, with her own Essentials by Ellen line of sequins in just about any color you could need ... check them out here! I used the Cool White Sequins on my flower center (held in place with a Craft Glue Dot) and to dot the "i" in my "spring" title. Have you ever created a project on something besides paper? This gorgeous canvas Mistable sheet was in my stash and just begging to be used. It's a fabulous surface for so many techniques. I've used a few today such as misting, stamping and embossing so why not join me for the tutorial? It's fun and do you know what I love most about it? Every time it turns out just a little different. I love the journey to the end result. Today's layout is for my daughter. She's off to school this fall and I really miss her. Scrapbooking is a great way to relive those memories and hold your loved ones close. This is what the canvas sheet looks like to start out with. It's already gorgeous plain but I thought I'd add a little color. First of all I started off with embossing some designs on the canvas. Simply stamp in Versamark Ink and then emboss with clear embossing powder. If you do this on paper, you will form a resist. Because fabric is a little more porous, it usually doesn't resist too well but gives a great batik look and subtle design to the canvas. Next up I added some misting to the design with Glimmer Mist. I love adding two or three colors together for a beautiful variation in the background. If you're in a hurry to continue, you can dry the canvas with a heat gun. Adding some colored stamping to the canvas added a little more interest. I've used Aquamarine Archival ink by Ranger here. The Archival Inks are the best I've found for stamping on fabric. Next step was to add some Stickles Glitter Glue to highlight the border of the design. This is the step that you won't want to rush to dry. Leave it and take a break for an hour. My favorite part of creating is always adding in the embellishments. This flower is misted like the background to coordinate. The blue Prima Heart Trinket is simply stunning. Canvas tags and butterflies are the perfect addition for this layout. A great way to adhere the buttons to the canvas is with Ranger Glossy Accents. Finally, the title is made up of some very cool Wood Tiles. I've misted them as well to make them tone in with the layout. Have fun pulling out your mists and canvas and explore the possibilities! Thanks for stopping by the CLASSroom! It is such a pleasure to welcome Eva Dobilas to the CLASSroom today! Eva is a true gem and I have absolutely loved getting to know her sweet, bubbly spirit. With all the happenings in life this past month I was BEHIND and when I asked her at the very last moment for her help showcasing the Unity Stamps this month, she so graciously accepted and knocked it out the park with her project today! Eva lives in Southern California and has been an avid scrapbooker and cardmaker for the past 14 years! She loves to create elegant, classy, sometimes dreamy cards, layouts and 3D projects. You may have seen her work in Cardmaker and Scrap and Stamp Arts Magazine. She loves using stamps, paint and dies on her projects and amongst current Design Team responsibilities she is happily designing for Creative Imaginations, Unity Stamp Co., My Favorite Things and Samantha Walker. You will find Eva teaching in California scrapbook stores. During her classes she shares the love of crafting with lots of tips and techniques. As well you will find so many inspiring and beautiful projects on her blog For the Love of Life. We would appreciate so much if you would head over to Eva's blog and help us thank her for sharing her ideas here in the CLASSroom. Please leave your comment on her post about being a guest here --- you will have a chance to win some of the fabulous products used in this post! A winner will be randomly selected from the comments left on Eva's blog For the Love of Life, before midnight PDT, Wednesday, August 17th and announced on Thursday, August 18th. Once again an enormous thanks to Eva for sharing this beautiful project with these wonderful tips and techniques! 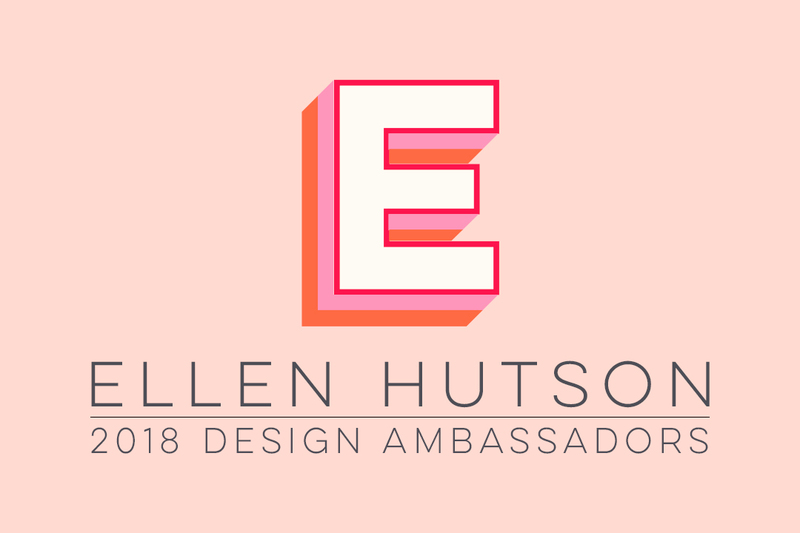 please contact us at customerservice@ellenhutson.com with your snail mail address! Thank you to all who visited Eva's blog and shared some love with her and thank you again to Eva for this beautiful creation and instructions! There are lots of layers and textures on this canvas, but there are two products I wanted to highlight in particular other than Unity Stamps and those are Creative Imaginations Real Wood Paper and Clearly for Art Blackout Modeling Film by Art Parts. First let me show you the products I used. And here are additional products I used including two Unity Stamp sets. One is a newly released Simple Stories Co-brand set called Generations and the other one is an IOD Co-brand set called Provencial Collection – My Dear. The canvas size I worked with is 6”x6”. Using Tim Holtz Tattered Florals Sizzix die, I cut out my flowers from the modeling film, and using Versamark Dazzle, Champagne color ink stamp the images on the two biggest flowers. Using a heat gun heat the die cut and stamped modeling film and once it gets hot, I molded them into the shape I wanted. I just wanted to achieve more dimension on my flowers. Next I ran my strip of Real Wood piece through my Tim Holtz Texture Fades Patchwork Embossing folder. Using white acrylic paint and a foam brush, paint the raised parts of the embossed image. I sprayed my canvas with three different color Glimmer Mists to get the background effect I wanted to work with. While my canvas was drying I started to stamp my images onto Simple Stories 100 days of Summer paper line and started layering my products on my canvas. I also added some pretty May Arts ribbon and lace I had on hand. To finish my black flower I wanted to add some interest for the middle, so I stamped one of the doily images from the Generations stamp set and cut out the middle part of it and added a button to the middle of it. Here is what my finished flower looks like. And finally I inked up our photo with Vintage Photo Distress ink and added it to the canvas using a Tim Holtz Memo Pin. Here is a close up angle of my canvas, so you can see all the layers on this. It's amazing at all the opportunities that come our way. Each special season of life is worth documenting and journaling about.Whether they are big or small, we all have dreams and they are all important. Last term at school my daughter had the most fantastic highschool co-op opportunity. We had the courage to imagine something wonderful but this was beyond our wildest dreams. Heather spent each afternoon of the entire semester at the hospital in the Organ Transplant Unit. To say we were thrilled would be an understatement. Her experiences ranged from hospital tours to transplant surgeries, data entry to ambulance and airplane rides. She made some lifetime friends but most importantly knows what she wants to spend her life doing. I decided to find a little courage and try out something a little more artsy for a layout design on this project. The new Tim Holtz Kraft Resist Paper Stash looked like so much fun, I just had to try it out! This paper is a beautiful heavy weight kraft paper that is perfect for layouts or cards. I wanted the beautiful resist to pop out on this design and immediately thought of my new Faber-Castell Gelatos. The color is so easy to apply and pops on the kraft background. As you can see, I didn't try to be perfect. I actually wanted the color to go outside the lines so othat the resist would show up. You can leave the Gelato colored as is or blend it in a bit with your finger for a softer look. I love how it adds interest to a monochromatic background. To continue my artsy look, I created my own collage title block with some great Tim Holtz stamps, some Glimmer Mist and Distress Ink. I've stamped them onto an Arturo Note Card cut into half. I love the texture of this paper and how it takes the ink. Beautiful! As always, I love to cluster my embellishments together for a pretty collage look. Journaling is always an important part of scrapbooking. If you like to keep things private, an envelope and tag approach is always a great idea and pretty too! This envelope is the new Tim Holtz Kraft Glassine Envelopes and is a really cool product. Hope this layout inspires you to have some creative fun and try something new! Thanks for stopping by the CLASSroom and have a fabulous weekend! A very merry Christmas to all of you! Today I wanted to share a scrapbook page of my sweet daughters that make the holiday season worth every sweet moment! Webster's Pages Sweet Season papers were a perfect match this time of year, but a lot of this Sweet Season 12x12 Paper Pack can be tweaked for any time of the year, as I've done here today! I used the beautiful round scalloped sheet of roses & "Christmas" tree paper from this pack, cut it up and used it in two different spots on top of the dress form paper. It's covering a few candy canes at the top of the page and I used the rest of it to frame the photo with more roses! The purple of the "Christmas" tree now blends in and works well to compliment the purple boa my oldest daughter is wearing. A Cosmo Cricket Buck Naked Alpha Buttons, letter "S" was covered with a smaller scale pink print from Webster's Petite Paper Pad-Waiting For Santa & Sweet Season. Basic Grey's Precision File Set makes it easy to sand and file the edges of any type of chipboard, especially this curvy letter S! I've had my set of files for about 5 years and it's still holding up very well -- most of the tools are metal and should last you through a lifetime of papercrafting! The chipboard S was tied with some beautiful green velvet ribbon from Webster's Sweet Season & Waiting For Santa Trim Collection. The letter is popped up on top of one of Ellen's fabulous white Small Doilies -- this pack contains some great sizes that are perfect for small accents on scrap pages or cards! The rest of my page title was created with the bright pink stickers that are included with this paper pack -- makes for quick & easy scrapping! I used Tonic's Retractable Craft Knife to cut around part of the dress form, so I could slip the photo underneath it and help frame the photo. The photo was framed with the "candy striped" paper from this pack -- love all the bright colors! The butterfly is another sticker included in this paper pack -- I adhered it to green cardstock and trimmed around it, then popped it up on foam tape. The lower right corner contains a Sweet Season Journaling Card, where I noted my girls ages and date the photo was taken. Journaling was done with Copic's Multiliner-Black .05 -- it's a great permanent acid-free pen that won't fade and will last ages! We all have those special people in our lives that make celebrations special. The ones who are family or might as well be, and the ones that we truly cherish. Today's layout is about those special people. My family. It's important to scrapbook those special people and moments to have something to remember them by. I started out this layout with a really fabulous embossed cardstock by Jenni Bowlin for Coredinations. I just love the texture these cardstocks add to a project. This is great if you want a textured look but don't have embossing folders or especially if you want a large embossed area. The package comes with four different patterns in five colors each. The cardstock has been sanded to reveal the inner white core. You can sand these cardstocks as much or as little as you wish. They are beautiful without sanding as well. Regular sandpaper works well but I really love using the Tim Holtz Sanding Block for ease. The new Togetherness line from Cosmo Cricket is absolutely adorable and worked perfectly with my theme. Who can resist those darling birds? The large circles were diecut with a large Circles Nestability Die. Banners are all the rage and I added a sweet mini one here for dimension. The Mixed Scallop Triangle Banner Mini Chipboard set is so darling. It comes with two pieces of chipboard for each pennant. The Snowcap Adirondak Paint Dabber made it easy to apply white paint to the bottom scalloped pennant. Each top triangle was covered with Togetherness paper. Thanks for stopping by the CLASSroom and have a creative day! Do you have products that you love but have been hoarding for that special project? I'm certainly guilty of that and if you're honest, I bet you are too. How about ideas in your head that you're going to try "someday"? How about photos that you love that are hidden away in an old box? You too, right? Since I've been guilty of all three, I thought it would be fun to challenge myself to tackle a few of these things in one layout. The technique I've been meaning to try out is spritzing the beautiful embossed cardstock that is the base for my layout. Isn't that a darling little picture of my daughter? It was hidden away in a box. If you're behind in your scrapbooking or have no idea where to start, let me tell you a secret. You don't have to scrap every photo you own and you definitely do not have to work chronologically. Do what inspires you and makes you happy and leave all that stress behind. Scrapbooking is supposed to be fun. The third thing I wanted to work into my layout was some super cool embellishments. The die cut felt is stunning and that trim, well, I think I want to wear it. It's way too pretty to hide away in a drawer so it's time I used it. The beautiful embossed cardstock starts off looking like this with a beautiful glossy pattern finish. Spray the chipboard with some Glimmer Mist and wipe off excess. To get a layered splatter that uses a different color, spray again with Glimmer Mist and allow the droplets to dry well before removing any excess spray on the design. It makes a beautiful artistic look. Thanks for visiting us in the CLASSroom today. I hope you find yourself inspired to try out a few ideas that you've been putting off! Have you started working on any projects for Monday's Floral Blog Parade? Join us then for a lot of inspiration and fun! The CHF Backgrounders I used were: Geometric Flowers II, Polka Dot Large & AlphaNumber. I used Ranger Distress Inks in Worn Lipstick, Sabby Shutters & Tumbled Glass. Next, I cut a piece of white cardstock 5.75" square and used this as my base to piece the stamped colored cardstock in an arrangement I liked, and rounded the corners with the 1/2" side of my Crop-a-Dile Corner Chomper. Next, I used Spellbinders Big Scalloped Square Nestabilities die (largest die in the small set) and cut four pieces of Sweet Corn Memory Box cardstock. Then I layered all four scalloped die cuts behind the colored scrap page base, overlapping one scallop -- this created a perfect 6.25" frame for my page! The frame is popped up with foam tape over the photo. Prima E-Line 4 Petal & 5 Petal flowers adorn the upper right corner and Zva Crystals accent the flower center and line dividing two of the stamped cardstocks. The little tag was cut with the smallest Spellbinders Tags Trio die from Lavender Memory Box cardstock and then I made a rub-on with my daughter's name, age & date by using Grafix Rub Onz ... this was the first time I had used this product and I can see all the fabulous possibilities it possesses! A little bit of white silk ribbon finishes this page.